Over the last eighteen months, Life – the Gallery has worked with Great Fosters Hotel in Egham to catalogue and develop their permanent art collection. Focusing on building Great Fosters’ reputation as an ‘Art Hotel’, they have also curated a number of temporary exhibitions for The Estate Grill, and have just published an ‘Art at Great Fosters’ book (click to view online here). 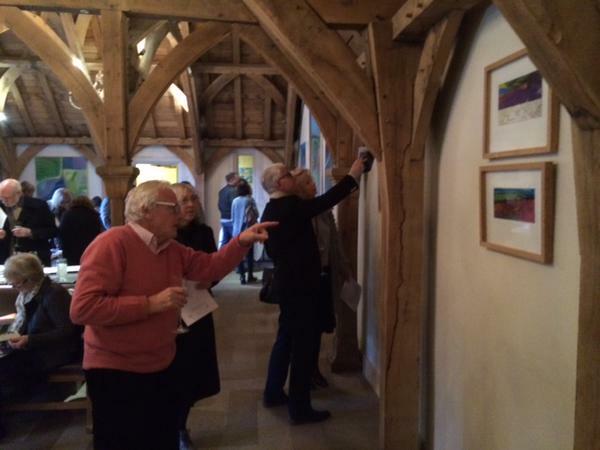 On Saturday 7th February, Life – the Gallery hosted an afternoon Art and Tea event at Great Fosters. 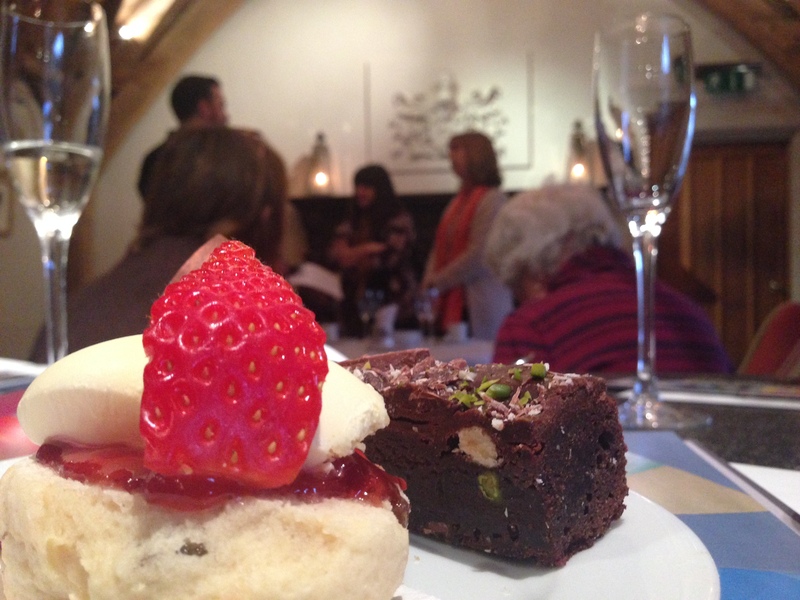 Guests were invited to meet current exhibiting artist Deborah Mitchelson and curator Kerry Kelly while enjoying some treats from the popular Afternoon tea menu. Deborah completed a BA at UCA, Farnham, Surrey, and went on to complete an MA at the University of Chichester, before exhibiting in both solo and group exhibitions across the UK. Her work springs from a variety of sources, from purely abstract ideas and from the seen world. Deborah finds the process of painting is an attempt to discover a clear, coherent, pictorial idea. Maps have appeared in her work for some time and stems from her interest in collecting maps and always having one with her when walking on the South Downs. She is drawn to the contours and symbols of maps and is inspired by the abstract system of co-ordinates and unspecified perspectives. Memory, experience and/or imagination influence the way in which she perceives the world and her paintings hover between a real and illusionary, imagined world. Guest artist currently is Mark Demsteader. 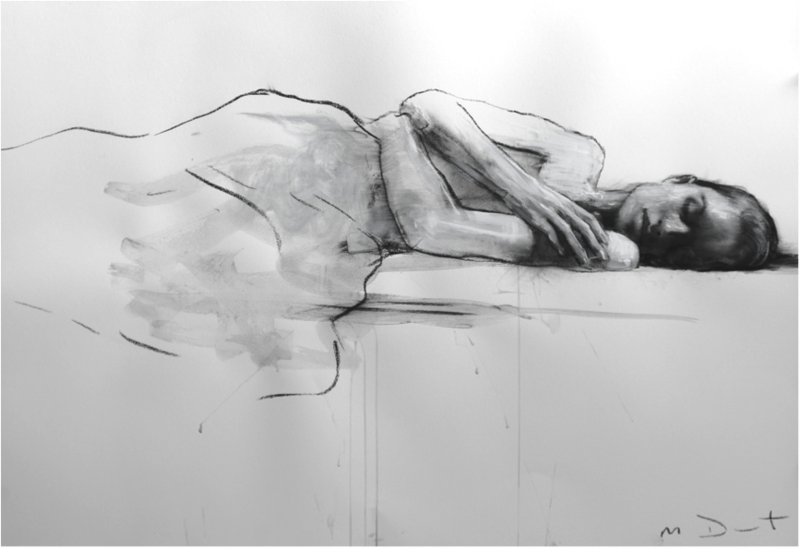 Mark is a popular figurative artists working in Britain today. His powerful depictions of the female form in clean and assured lines of pastel and gouache have sparked a renaissance of interest in traditional life drawing amongst the art collecting fraternity. The painting below can be seen in the bar/ante room adjacent to The Estate Grill. Look out for our review of The Estate Grill’s new menu and the also the new Contemporary Still Life Exhibition which takes the place of Deborah’s work from this week. Design Restaurants members can dine complimentary and enjoy the art in The Estate Grill when using their cards for lunch or dinner Monday to Friday. Click here for more details. Great Fosters is keen to reward its loyal guests and neighbours by inviting them to join the The VIP club and enjoy delicious food, fabulous services, privileged gifts and special offers combined with extraordinary value. Complimentary dining when dining in The Estate Grill or al fresco on a Monday to Friday and enjoying a minimum of two courses per person. The member pays the total bill, less the complimentary meal. This is calculated by dividing the total bill, excluding beverages, tobacco and gratuities, by the number of persons in the party. Only one card permitted per table. Advance reservations are strongly recommended. One complimentary full afternoon tea voucher to redeem when enjoying afternoon tea with one or more guests – valid Monday to Friday. One £25 wine voucher redeemable when dining in either restaurant. A complimentary luxury stay in an Executive Double Room including breakfast for two following four dining visits, valid Sunday to Friday. One Sunday stay voucher entitling the member to stay in an executive double room including breakfast for £95 when dining on a Sunday evening. Automatic upgrades on check-in subject to availability on day of arrival. Three pool passes for up to four adults per pass – valid 10am – 5pm, Monday to Friday from May to September as weather permits. Some restrictions apply and pre booking is essential. One £250 private dining room hire voucher – valid for parties of eight or more. One £250 meeting room hire voucher – valid for parties of 10 or more. Priority invitations to a selection of seasonal events throughout the year at member rates. Complimentary enrolment into Design Restaurants Club, providing exclusive offers to dine in other leading restaurants in the UK (usually £90). Luxury Restaurant Guide is the place to discover and book the finest dining experiences at all highly awarded restaurants throughout the UK. A must-visit site and FREE app for all food lovers. Subscribe to the Club, the largest fine dining club in the UK from just £10 per month, to receive instant rewards, insights and invitations from over 500 leading restaurants. What traditions are associated with Easter Monday?